The students at Colaiste Pobail Acla are extremely talented. The majority of students can already play an instrument and are well used to performing. Their skills are well nurtured during their time at National School in the area and through the work of Scoil Acla. Many of the students are involved in the local pipe bands. The students give generously of their talents, rallying together to perform for school events such as the School Mass, Christmas Carol Service, Award and Graduation ceremonies. 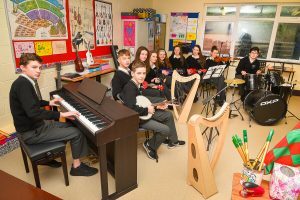 Music is an optional subject for both Junior and Leaving Certificate. Transition Year students have an input in the production and the storyline from each show. This year’s Transition Year Drama entitled “An Bhó” was a resounding success. This play was performed completely through the medium of Irish. Students play an active role in the choreography of the shows, working together with teaching staff to polish their drama techniques and routines.